Ahhhhh…. I can’t believe this is the last installment to the Crossing the Line Series. It truly is a bittersweet feeling to say goodbye to these cast of undercover misfits that Tessa Bailey has created. And in her final installment, Tessa Bailey sends her readers on one final suspenseful epic journey where a disgraced cop falls hard for a criminal’s daughter and together they find redemption, love, and a second chance at life. 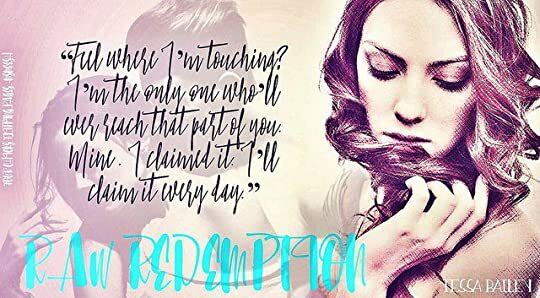 In Raw Redemption, Tessa Bailey introduces readers to Henrik Vance, a disgraced cop who ruined his career when he got rid of evidence that would put Ailish O’Kelly behind bars. And so in order to protect Ailish and redeem himself, Henrik must take it upon himself to be part of this secret undercover unit where a bunch of misfits and criminals are put together to take down criminals. And in this specific case regarding Ailish O’Kelly, Henrik makes it his mission to protect the girl from her criminal father even if it means breaking the law and killing. Who is Ailish O’Kelly? Ailish is not only the daughter of a ruthless criminal but she is also a prisoner of her father. Forced to do his dirty dealings, Ailish had enough of that life that kept her captive. And so when Ailish ran away from her father, a bounty was on her head for her return. Well it didn’t take long till her father’s lackeys discovered where she was hiding and so she was forced to run and hide again. But this time, Ailish didn’t count on Henrik showing up on her doorstep. When Henrik shows up, Ailish is taken aback by his presence. She doesn’t know what to make of Henrik and his domineering and gentle personality. She is well aware that they both are sexually attracted to each other and it was only a matter of time till their raw sexual tension could no longer be contained. Henrik knows without a doubt that Ailish is unlike any other woman that he has met. Her beauty, strong personality, and intelligence was driving him mad with lust and it continued to get stronger each time they spent with one another. But with danger threatening the safety of Ailish, Henrik will do what is needed in order to protect the woman that has gotten under his skin and heart. Ailish wants a fresh start. A new start in life where she doesn’t have to be defined on what she did for her father and his criminal activities. How far will Ailish go to redeem herself? Will it mean sacrificing herself to protect Henrik? Raw Redemption is a great final conclusion to this series. Yes, it is a bittersweet feeling to say goodbye to this beloved cast of criminal misfits but in the end they each played an important element as to why Crossing The Lines Series is one of my favorites series by Tessa Bailey. In this last farewell to the crew, TessaBailey will remind us once again that even criminals and disgraced cops can redeem themselves if they want to. And for Henrik and Ailish, they not only were able to get their second chance at life but they were also able to heat up the pages of our e-readers. So if you are looking for a story that intertwines steam, suspense, romance, heat, passion, and second chances then look no further than Raw Redemption and the Crossing The Lines Series. And if that doesn’t persuade you in reading then you are truly missing out on a great series by Tessa Bailey. Raw Redemption is a great final conclusion to this series. Yes, it is a bittersweet feeling to say goodbye to this beloved cast of criminal misfits but in the end they each played an important element as to why Crossing The Lines Series is one of my favorites series by Tessa Bailey. In this last farewell to the crew, Tessa Bailey will remind us once again that even criminals and disgraced cops can redeem themselves if they want to. And for Henrik and Ailish, they not only were able to get their second chance at life but they were also able to heat up the pages of our e-readers. So if you are looking for a story that intertwines steam, suspense, romance, heat, passion, and second chances then look no further than Raw Redemption and the Crossing The Lines Series. And if that doesn’t persuade you in reading then you are truly missing out on a great series by Tessa Bailey.